The privately-owned Deans Place Hotel is a handsome 14th-century building set within four acres of tranquil grounds in the pretty Sussex village of Alfriston. Inside, the friendly Dining Room is a popular restaurant with locals and visitors alike, serving a straightforward menu of international classics in a bright and well-appointed dining room. 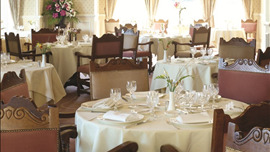 Choose from a range of creatively designed menus, which incorporate local produce and the finest ingredients. The perfect venue for a business lunch, an elegant evening meal or Sunday lunch, Harcourt's also offers its own private dining section for special celebrations. Two courses are £32 per person, three courses are £38 per person including coffee and petit fours.